Wes Freyer recently reported on a digital learning conference in Oklahoma. In this report he included a video about the money potential in digital learning that is embedded below. The presenter outlines the money in Pennsylvania Cyber Charter Schools along with the scope of the money involved in digital learning and executive salaries. The point is that education is already big business. To vilify the digital learning movement over executive compensation is a red herring. Nobody is in the education “market” for altruistic motives. While teachers pledge to help students, they have mortgages, children’s college tuition, and utilities to pay. Everybody gets paid. The video ends with a student staring into a computer screen into a darkened room. Another red herring. As has been written here before, learning online is not learning alone. Interactions with other students and teachers are essential for digital learning. The challenge for educators is that we need to be engaged. We have been able to block many movements, but this one has the capacity to change schools as we have known them. It’s more than “integrating” technology into classrooms. Digital content a new way for students to learn and a new way for teachers to teach. Online Learning: Shouldn’t We Do Better? Over 1,900 conferees assembled in Indianapolis for the Virtual School Symposium November 9-11, 2011. My notes from the day follow. A wiki is available for the event. On Wednesday, I participated in a day long workshop for participants starting online programs. Holly Brzycki, John Canuel, David Glick, and Phil Lacey presented about their specialties: curriculum, leadership, technology, policy, and professional development. The program started with a panel of teachers from across the country. Fostering Quality in Digital Learning. I wrote a separate review of the session here. The essence of the presentation was policy development so that market forces can produce new learning platforms. My thoughts are that the presenters are missing an important factor in their calculations — teacher-student relationships. Presenters were no-shows at two of the sessions I attended, although audience members rose to lead discussions that were similar to the titles in the program. This speaks to the interest of the participants, but the program committee, of which I am a member, needs to do a better job ensuring that speakers are in attendance. In the lunchtime presentation by Steve Midgley (US Dept of Education), he reviewed technology advances with Google, Youtube, and others. Not much new here. Mickey Revenaugh from Connections Academy lead a panel discussion about course quality. This was a different discussion from the policy issues discussed earlier in the day. While vendors were on the panel, the discussion was about how to develop quality courses. The participants did not feel “sold.” The design process includes visual literacy concepts and prototyping new courses sections with students. Teachers’ loads are determine by the amount of grading effort by the teacher and teacher-student interaction. Assessments, standards, and such were discussed. Some measures of quality include end of course exams, mastery learning, and growth models. Interestingly, one vendor collects student feedback on each lesson with a 5 star rating system and a text box for specific comments. Ratings and comments are used to make changes in content. On the evening of the first day of VSS, the planners provided an exceptional evening of food and entertainment at the Indiana Roof Ballroom. Vendors had evening receptions, making it a parade of events for the evening. Big box stores where customers troll the aisles with carts, moving goods from the stores to their cars. Banks were ATMs serve customers and banks use online statements. In schools, Peterson stated, students are the most important part of unpaid labor. We must look for student engagement in courses to get them to learn what they should know. Like others, including Horn, Peterson stated that we are at the beginning of digital learning and much possible as technology improves, such fully interactive and 3D. He stated that competition between blended learning and online learning will improve options for students. The system must be transparent with standards, curricula. Student accountability is essential. The learning must be verified. The system must be flexible. There must be a policy framework for competition. 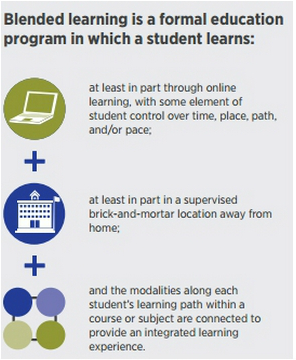 Blended learning ensures success for many types of students. Social networking will become important. Funding based on successful completion of the course. Student have access to the best courses and best teachers. She outlined how she was able to shepard the bill through the Utah legislature. Robyn was passionate and articulate about the topic. She has a winning attitude. My final breakout presentation was about how Hall County, GA is implementing digital learning in its schools. The program includes curriculum development and sharing, infrastructure design, assessments, and professional development. 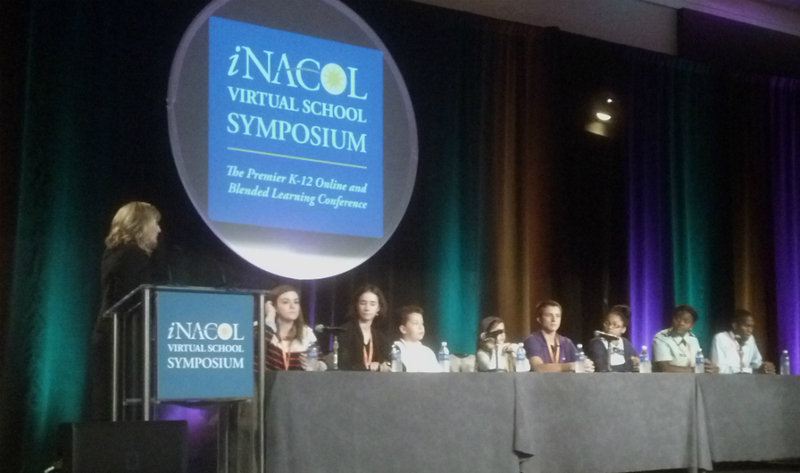 The day and conference concluded with a student panel presentation. Students explained how and why they were in online and blended learning programs. They talked about their challenges — some of the content is hard to learn — to their triumphs — I can take my school with me when I travel. It was a great closing to this conference. The next VSS is October 21-24, 2012 in New Orleans.